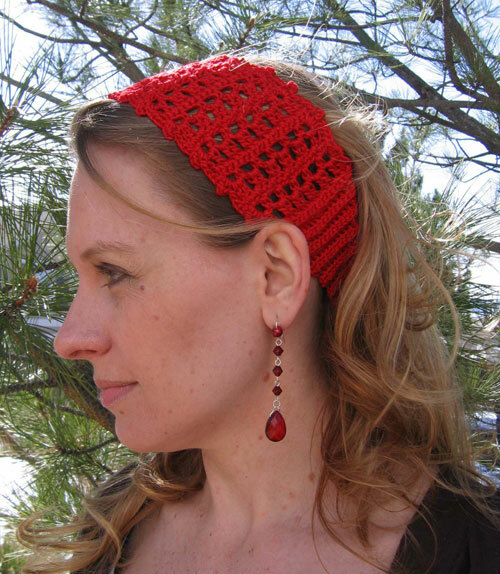 This easy openwork lace headband is a bright accessory for a hot summer day! 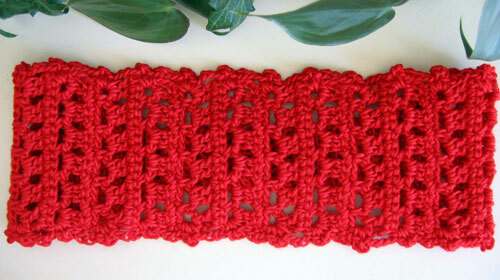 Make one to match every outfit in your summer wardrobe and keep yourself cool no matter what. US D/3 (3.25 mm) or size needed to obtain gauge. Manufacturer’s website lists Art. 2029 Rayon Super Petal Spun as worsted wt., however in this pattern it is worked at a tighter gauge on a smaller hook. Headband is worked flat back and forth in rows from narrow end at center back. Shaping is achieved by increases/decreases along edges. Piece is joined in a circle with whipstitch seam. Picot finish is worked along both edges. There is no right or wrong side to this pattern. The lace pattern repeats over three rows, so right and wrong side rows will alternate over the three-row repeat, producing a stitch pattern that looks the same on both sides. Ch 1, turn, sc in blo of ea sc across. Working the back loops creates the ribbing section. Ch 1, turn, sc in blo of ea sc across. Row 16 Rep row 12. Row 18 Rep row 12. Row 20 Rep row 12. Rows 25-63 Rep rows 22-24 until a total of 43 lace pattern rows have been worked, ending with row 24. Row 66 Ch 1, turn, sc in blo of ea sc across. Row 68 Rep row 66. Row 70 Rep row 66. Row 72 Rep row 66. Rows 74-83 Rep row 66. Fasten off, leaving an 18” tail for sewing. Working along side of center lace pattern section, join thread in end of last sc row before start of lace section. Ch 1, sc in same st, *ch 4, in end of next ch-3 sp row work (sc, ch 3, sc)(picot completed),* rep from * to * across to last row of lace section, ending with ch 4, sc in first sc row at end of lace section. Fasten off. Repeat picot edging on other edge of headband. 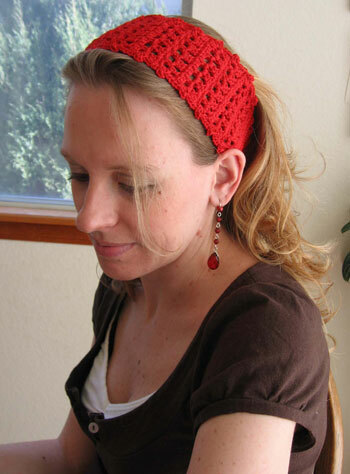 Fold headband in half so that the narrow ends meet making sure there is no twist in the piece. Holding narrow ends together, whipstitch through both thicknesses to sew seam using the 18″ tail remaining from the second half of the band.